Academic research about how local governments use social media platforms are scarce. Most of the research is focused on services, comparative perspectives, or assessment. Little is known about the impact of Twitter and Facebook on communication means or strategic use for promoting a conversation with citizens. Despite these facts, the majority of local governments implement social media into their web sites and communications without any strategy or knowledge about their advantages or perils. Also scholars are blind-folded of what kind of research has to be done on social media and governments to understand this phenomenon and capitalize its use on public service. 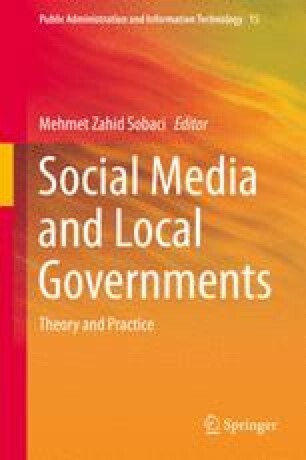 The purpose of this chapter is to identify new trends and lessons on social media use in local governments. Analyzing a data collection of Twitter and Facebook from the 32 Mexican local governments from 2010 to 2014, we discovered a behavior pattern very similar to the diffusion and innovation theory proposed by Rogers (Diffusion of innovations. Simon and Schuster, New York, 1995). We analyzed our data from this focus and provide five lessons to understand local governments’ use of social media.